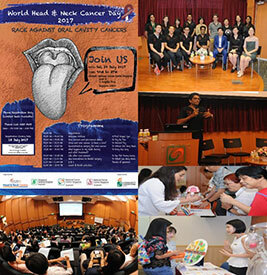 World Head & Neck Cancer Day 2017 - "Race Against Oral Cavity Cancers"
Report from Singapore: Head and Neck, Reconstructive and Dental surgeons with Allied Health Specialists (Dieticians, Physiotherapists, Speech Therapists and Psychologists) congregated to celebrate the theme “Race Against Oral Cavity Cancers” for World Head and Neck Cancer Day 2017. This was in conjunction with the National Dental Centre, Singapore and the focus was on etiology of oral cancers, reconstructive surgical options, dental care, and recent advances in this field. The Head of SingHealth-Duke-NUS Head & Neck Cancer Centre, Associate Professor Gopal Iyer delivered the welcome address. A total of 126 participants enjoyed the finale of interactive booth sessions organized by allied health teams. It was a day to commemorate the gift of the gab!